Have you ever wondered how the native cacti of the Sonoran Desert can survive the hot, arid challenges of Arizona summer? It turns out that many cacti get by with a little help from their friends. In an evolved connection, cacti thrive in conjunction with colonies of ants, both specially adapted to benefit the other. Looking close at a cactus can reveal hidden worlds. At the base of their spines, many Sonoran cacti have tiny structures that are specially adapted to collect and hold water from the atmosphere. At the base of a cactus spine is a plant structure known as a tubercle. The cactus tubule has pronounced defenses: usually a large spine and smaller fuzzy-looking spines known as glochids. Amidst these defenses where a spine connects to the body of the cactus, a ring of trichomes, fibers whose sole function is to collect and absorb moisture like a sponge. Trichomes help the cactus collect water through the tubercle and secrete tiny droplets of a sugar-water solution. The tubercles of cacti are technically known as “extra-floral nectaries” acknowledging their role in producing a plant sugar solution even after the brief Springtime flowering cycle of the cactus is over. While the tubercles are too small for humans to pay them much mind, they mean the world to the survival of desert insects like bees and ants. Even after the extravagant blooming season of the cactus is over, bees and ants can continue to harvest sugar and water from the tubercles, sustaining themselves through the hottest months of desert Summer. 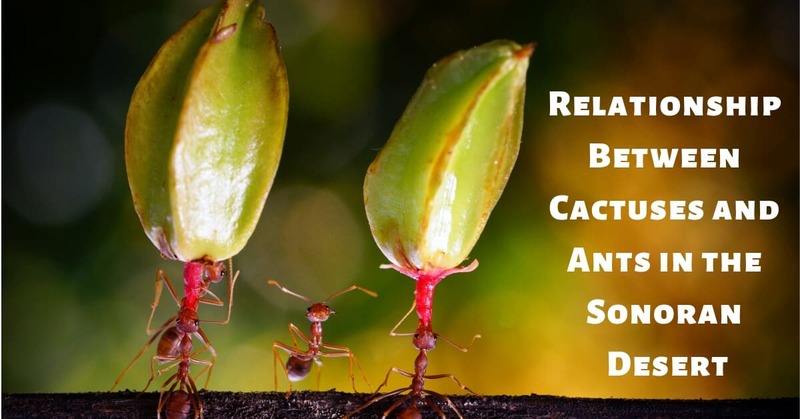 While generous may not be the right word for the ant’s role in the cactus’ biology, ant colonies do strengthen and benefit the cacti they gather nectar from. Underground ant colonies that grow near a cactus will defend their food source tooth and nail from encroaching insects and animals. Larger creatures which may damage or break the skin of the cactus are often kept at bay by the aggressive swarming of ants around the body of the cactus. Thus, the cacti are protected from injuries that leave them vulnerable to losing critical moisture reserves. Ant colonies also provide a hidden benefit for the cacti they harvest from. The subterranean ant colonies add nutrients and aeration to the sandy desert soils. Ant waste, the organic matter they bring into their colonies, and the bodies of dead ants enrich the ground around their colonies with nitrogen and organic matter. The tunneling structure of ant colonies break up compacted soil and make it easier for the root systems of cactus to grow and expand. Ant hills and underground ant colonies that grow near a providing cactus may help the plant as much as the cactus’ sugary nectar helps the ant population. In this mutually beneficial relationship, the delicate balance of life in the desert continues to sustain itself. Spring is a time of bounty for the Sonoran Desert. With an abundance of flowers and blooms, life leaps into action as the days lengthen and warm. The Sonoran Desert enjoys a brief period of flowing rivers as snow melt begins moving down from the surrounding mountains. Springtime is one of the desert’s most fertile periods. Wildflowers are some of the first signs of the season. With adequate rainfall, such as we had this past Winter, the desert’s landscape bursts with the vivid colors of poppies, mallow, lupine and a rainbow of other native flowers. Cacti use the extra waterfall of winter to initiate a spring growth spurt, expanding their roots and growing new segments. Pollinators like bees work hard to take advantage of the abundance of food, ensuring their wellbeing as the harsh summer begins to take hold. What are you going to do to thrive as the temperatures rise this season? Getting CC Sunscreens fitted for your home and business is a great way to add comfort and style to your life even as an Arizonan Summer heats up. CC Sunscreens come in a full selection of durable colors and styles and are custom made for your needs. With CC Sunscreens, protection your space stays comfortable year-round while efficiently reducing your energy bills. Want to know more about our sunscreen services? There’s never been a better time to contact us an see what CC Sunscreens can do for you!